Susan B Anthony, who led the fight for women’s suffrage in the United States, once said, “Independence is happiness”. She was talking about the ability to choose – to choose your representatives in government, to set your own course as a free person. The same is true today. The ability to independently choose without unnecessary constraint often leads to better and happier outcomes. Unfortunately, in the financial advisory industry, the ability to be independent and freely choose is often impeded. As you may know, Australia’s banking, mortgage and insurance industry recently underwent a royal commission inquiry. Here in New Zealand we’ve followed this inquiry with great interest. There have been a number of findings related to investment advice. Vertical integration is the combination, in one firm, of two or more stages of production; stages which are typically operated by separate firms. For example, if an adviser recommends a product owned by their employer, or recommends buying or selling a product where their employer gets paid to process the trade, they are vertically integrated. The commission has found this behaviour to be rife in Australia, predominantly in major banks and institutions, and they’ve suggested it’s led to conflicted advice. For example, the Australian Securities and Investments Commission (ASIC) looked at ten vertically integrated advice offerings. They found that, while only 21% of the products on their respective approved products lists were manufactured in-house, these 21% of products received a whopping 75% of the money from new investors. You wouldn’t imagine this happens by chance. It’s more likely it happens because there is either pressure or inducement to put new money into investments manufactured in-house. Some organisations agree to purchase adviser businesses when the adviser retires. The clients are generally assigned to advisers within the new organisation, but some clients are ‘orphaned’. There were instances where an organisation had charged a client an advice fee where no service was being provided1, or even after they’d died2! To cap it off some organisations lied to regulators about the practice, because it was profitable3. The commission has found other issues related to insurance and mortgage lending as well. We’re proud to tell you that we are a completely impartial firm, but what does that mean exactly? It means that we are free to use practically any investment available to retail investors in New Zealand. It means that we only recommend those investments our research shows to be in our clients’ best interests. It is for this reason the investments we recommend are very low cost, in comparison to averages in New Zealand. 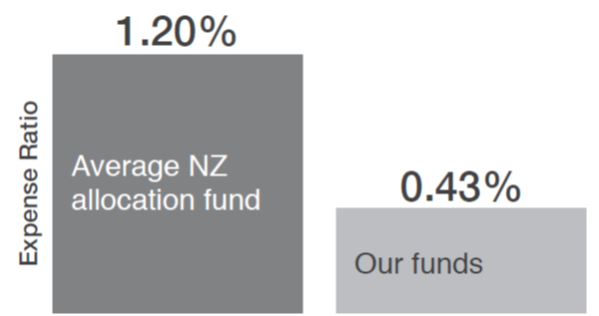 The chart below shows the average cost of an allocation fund in New Zealand (data accessed from research firm Morningstar), compared to a 50% growth/50% income portfolio we recommend. Perhaps now, more than ever, it’s clear why being impartial is so important. When working with new clients, this can sometimes be seen as a disadvantage. This is because we don’t have the brand name and reputation of a large bank or institution. Who are we compared to them? However, if we wanted to work for an institution such as a bank, we could. We don’t, though, because we want to be in a position where we can advocate for our clients’ best interests without any outside pressure. We want to be in a smaller business where we personally know our clients and, frankly, we know when one of them has passed away – there is no such thing as an orphaned client here! Being large isn’t necessarily an advantage in the advice business, because the advice business is, and will always be, a relationship business. Although there have been lots of rumours about banks and larger corporates within the financial services industry, we prefer to ‘hang our hat’ on fact and focus on being committed to our business and our clients for the longer term. Change is opportunity and always provides a base for reviewing processes and systems, so we view any challenges in the industry worldwide as an opportunity to enhance the experience our clients receive from us. We are actively growing our business and have an independent, relationship driven business model, which we are proud of, with having the best interests of our clients at the core of everything we do. We believe that greater adviser impartiality helps us provide perhaps the most important thing we can for our clients – their own financial independence.